Trained at the renowned Paris Opera Ballet School for 7 years, Chloé pursued her career as a professional dancer for American Ballet Theater in New York, Les Grands Ballets Canadiens in Montreal and English National Ballet in London where she performed ballets from classical repertoire such as Swan Lake, La Bayadere, Don Quichotte, Raymonda, The Nutcracker, Romeo & Juliet, Coppelia…on many prestigious stages such as Palais Garnier, Metropolitan Opera House, Kennedy Center and Royal Albert Hall. In 2006, Chloé completed her teacher certification in the Centre National de la Danse in Paris to obtain her Diplome d’Etat in Ballet. She has been teaching in several Conservatories and Schools in Paris and New Caledonia. 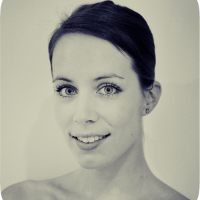 Chloé moved to Vietnam in 2013 where she has been teaching for children and adults as well as preparing students for international competitions, auditions and summer intensive programs. At the same time, she has been dancing as a first soloist with the Ho Chi Minh City Ballet and has been in charge of the company daily training and rehearsals.